Without having tasted a specific new juice mix before, an orangutan in a Swedish zoo has enough sense to know whether it will taste nice or not based on how he recombined relevant memories from the past. Only humans were previously thought to have this ability of affective forecasting, in which prior experiences are used to conjure up mental pictures about totally new situations, says Gabriela-Alina Sauciuc of Lund University in Sweden, in Springer's journal Animal Cognition. In general, making decisions is much easier when one is guided by prior experience, but this is not always available in new situations. In such cases, affective forecasting becomes important. It enables people to predict whether a situation will be pleasurable or not, by mentally recombining elements of prior experiences into possible scenarios, and by allowing people to pre-experience what these might feel like. Affective forecasting saves people the costs and risks of having to engage in actual behaviour to find out how new situations might turn out. This ability is believed to have evolved only in humans. For example, given prior experience with the ingredients, but in the absence of direct experience with the mixture, only humans are thought to be able to predict that lemonade tastes better with sugar than without it. In contrast, all other animals are thought to be stuck in their previous experiences. At best, they should be able to predict that the juice they tasted before will taste the same again. But they would be unable to realize that a novel mixture of known juices will have new gustatory qualities, which depend on those of the ingredients. Faced with such new situations, animals are expected to be clueless and act by trial-and-error. To examine whether affective forecasting is indeed limited to humans, Sauciuc's team developed a non-verbal test to assess how an animal responds to new tastes. 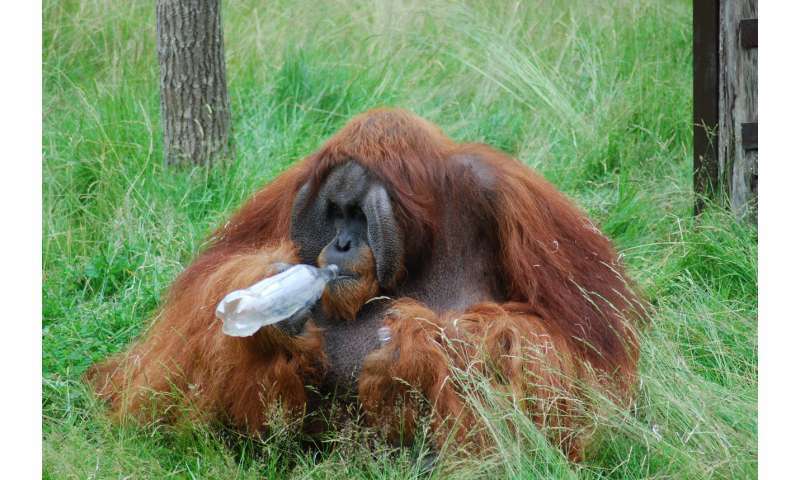 A 21-year old male Sumatran orangutan (Pongo abelii) called Naong living at Furuvik Zoo in Sweden was part of the study, as were ten people aged between 20 and 35 years old. The tests among others required all participants to mentally construct new juice blends from ingredients they already knew, and to predict whether the end products would be enjoyable or not. In the process they combined four familiar ingredients (cherry, lemon, rhubarb and vinegar) into six drink mixes they had never before tasted. It was found that both the human subjects and the orangutan consistently made choices that reflected their particular taste preferences for the various ingredients. They could mentally integrate relevant memories to generate new liquid blends, and predict whether the end product would be tasty or not. The orangutan's performance in this regard was within the range of that shown by the humans. The animal made consistent choices when confronted with never-before experienced situations, and did not respond randomly by way of trial-and-error. Most importantly, at the end of the study, the researchers found that these consistent choices matched the orangutan's settled preferences for the mixes. This indicates that his choices in the first encounters with the novel situations were indeed guided by predictions concerning the taste of the never-before experienced mixes. "The orangutan, just like humans, seems to have been able to make hedonic predictions concerning never-before experienced events," says Sauciuc, who adds that this relationship was confirmed when the data obtained in the study were incorporated into statistical models. Sweet, tasty and healthy—the new essence of juice? "Hedonic predictions" are the bases for Benthamite utilitarianism that treats humans as no different than animals.